Born on 17th February 1972 in Karlovac, Croatia. Unknown to most Spurs fans when he was signed by Glenn Hoddle in June 2001, the Yugoslavian made a refreshing impact on the Spurs fans during the pre-season games leading up to the 2001-2002 season. Starting his career at Rad, he was a Yugoslavian international following his move to Red Star Belgrade, where he won League and League Cup medals. Playing in the hole left in the middle of defence, he has brought new skills to the Tottenham back line. Not your typical physical, "get stuck in" English defender, Goran uses his reading of the game to dispossess opponents, using his brain most of the time and his head when needed. The most telling aspect of his game (and the one why Hoddle signed him) is his use of the ball from the back. Bunjevcevic is able to bring the ball out of defence as he has the ability to run with the ball, but he also is aware of any movement up front, so can look to make a pass which will start a move going forward. This could open up a new tactic for the club, as the distribution from the defence has notoriously been poor. It remains to be seen how he fares against the best that the Premiership can offer, but he has Champions League experience and also played against Leicester City in the UEFA Cup a couple of seasons ago. He should be aware that it is fast and furious in the Premier League and if he can sort out any communication problems, he could have featured as an integral part of Glenn Hoddle's passing revolution. Unfortunately, an early injury ruled him out of the first batch of games and when he returned, he got an elbow in the face from Hasselbaink, which kept him out of the side for the rest of the season. Back in the team for the start of 2002-03, he played on and off for the team throughout the season, without establishing himself as a regular. The same happened at the beginning of the 2003-04 season, but when David Pleat took the reins, he was ousted in the 4-4-2 system, where he would have had trouble fitting in. After this Goran featured little in the side, but was a regular standby who was called upon when needed and was in the side that took to the field against Oldham Athletic in the League Cup on 22nd September 2004, when he netted his first goal for the club and a month later at Bolton Wanderers he scored his second and last goal for Spurs in the same competition. Picked up a scary injury against Charlton Athletic on 6th November 2004. A routine kick on the shin in the 15th minute ballooned at half time and the medical staff sent Goran to hospital, where he was operated on as the central defender had developed acute compartment syndrome. This is where blood enters the muscles and cannot escape, causing pressure on the tissue and this can cause a great deal of damage. His injury came at a bad time, when Goran was having a good run in the team and had scored in the away League Cup ties at Oldham Athletic and Bolton Wanderers. 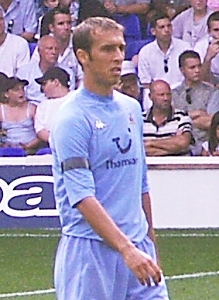 Despite not getting a place in the team, Bunjevcevic was the model professional in the Reserves, who he captained to the Premier Reserve League South title in 2005-06. The central defender was released by Spurs at the end of the 2005-06 season on a free transfer. Spent one season at ADO Den Haag in Holland before retiring from the game and returned to Red Star Belgrade to take up the Sporting Director's role in March 2008. NICKNAME : "Bunjy Man"; "The Beckenbauer of the Balkans"